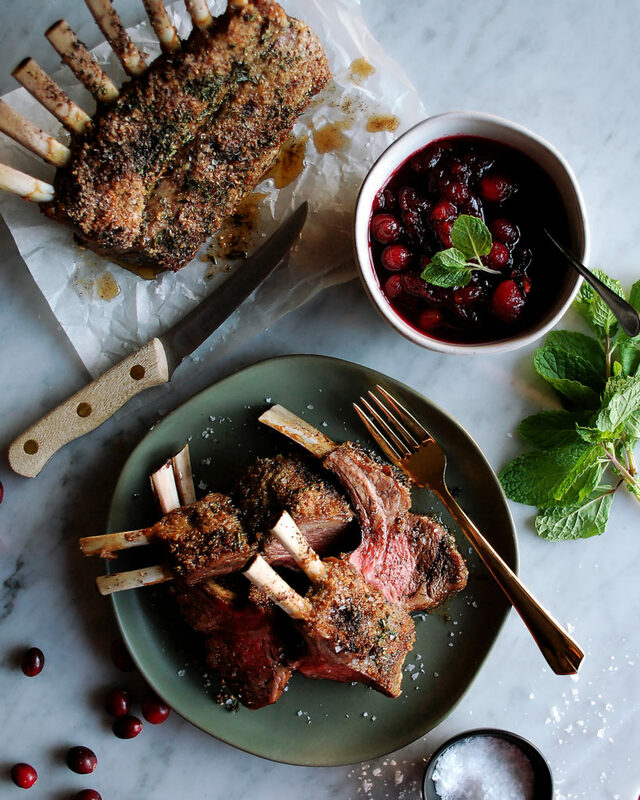 What better way to start the Christmas week than with a festive holiday party entrée idea: herb roasted rack of lamb with mint cranberry chutney. 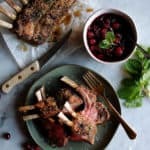 Everyone is looking for easy ways to entertain for Christmas, and this herb roasted rack of lamb is going to be the star of the table. Not only is it a show-stopper, but it couldn’t be simpler to prepare. And it all starts with using really high-quality lamb. That’s why I am so excited to have partnered with Atkins Ranch to showcase their beautiful, 100% grass-fed and grass-finished New Zealand lamb, which can be found at all Whole Foods locations. Trust me, it makes such a difference. Atkins Ranch is the first lamb producer in the world to achieve Non-GMO Project verification and Global Animal Partnership Step-4 accreditation for their lamb. The natural way they raise their animals not only helps protect animal welfare, but also really shows in the finished product. Once roasted, the meat is tender, juicy, and has a wonderful subtle flavor. I have some big meat eaters in my family, and this lamb was definitely approved by them! My dad even requested it again for Christmas Eve dinner (with these cheese fritters alongside). And if you’re intimidated by cooking lamb, don’t be. 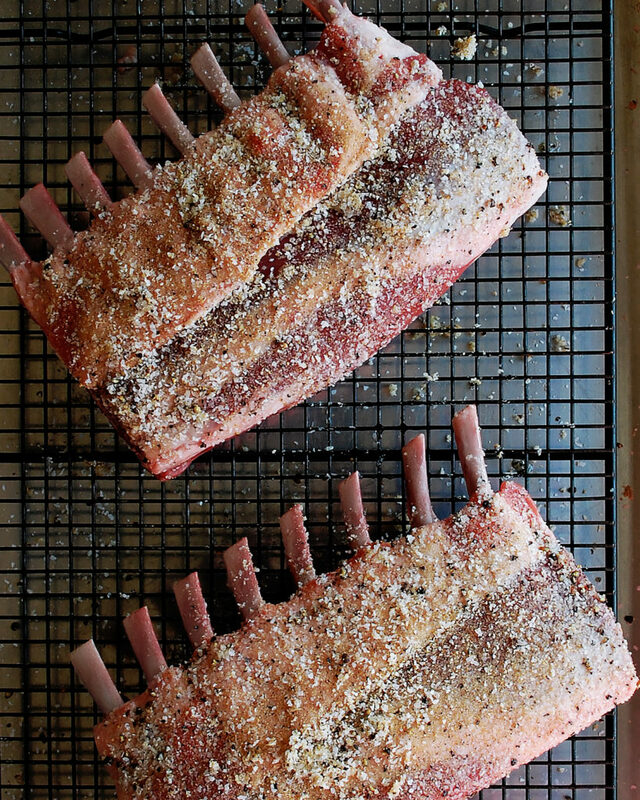 Here’s the breakdown: rub the racks with a flavorful spice mixture, roast them for 25 minutes, rest, slice, and done! The rub is simple, but necessary to create a salty crust. Then, an herb infused butter is drizzled over the top, right when they come out of the oven. 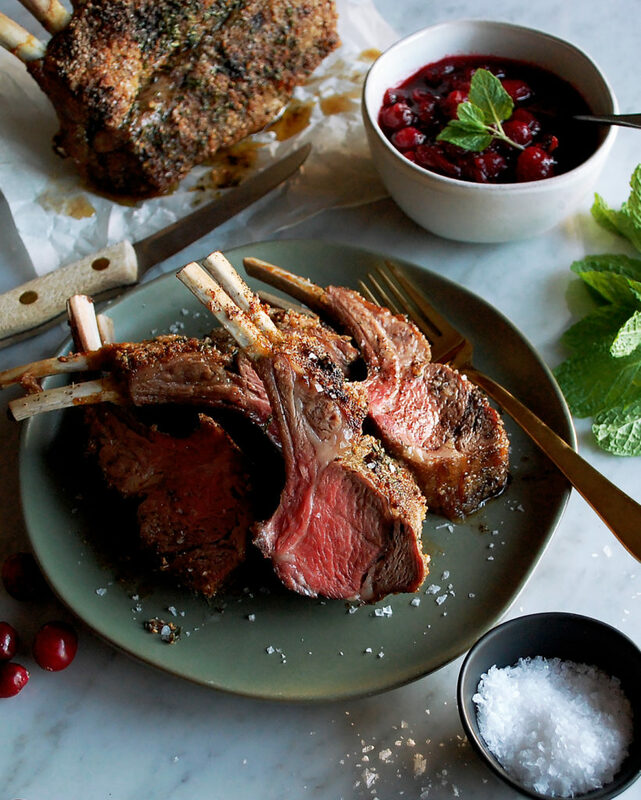 The only thing that could make this even better is a sweet, tangy mint cranberry chutney. 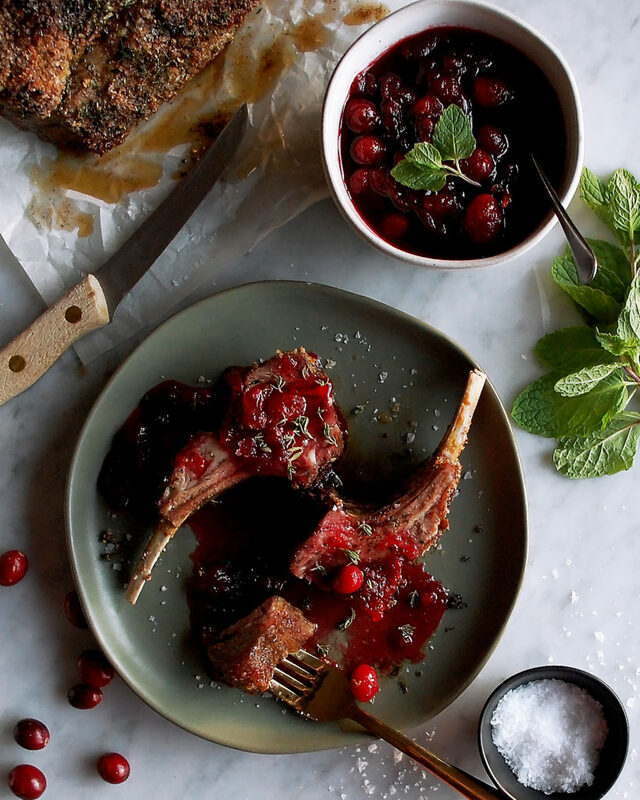 Mint and lamb is a classic combination, so I thought it would be fun to make a festive cranberry chutney that’s infused with fresh mint flavor. So, when you’re planning your holiday menus, definitely get over to your local Whole Foods to pick up an Atkins Ranch rack of lamb in the meat department. Your guests will be so delighted to gather at the table around such a beautiful dish. 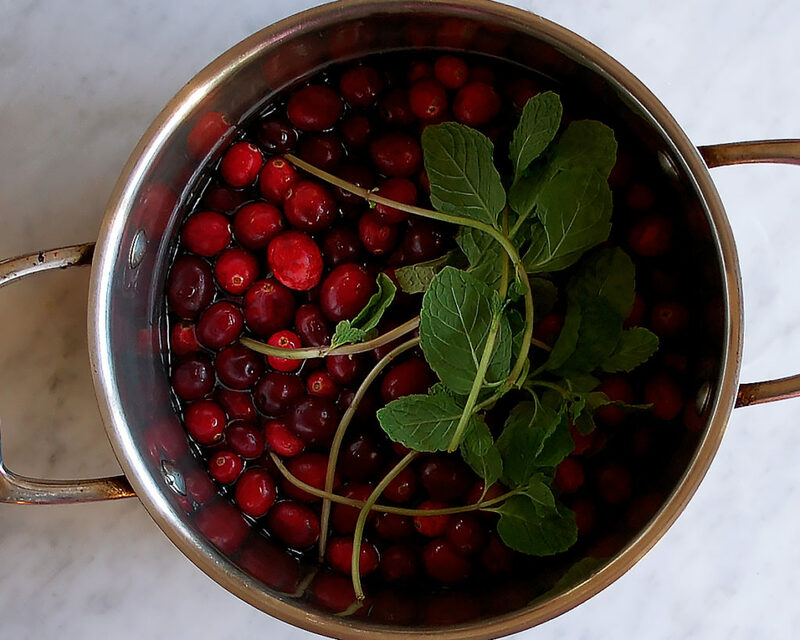 Combine the cranberries, apple cider, apple cider vinegar, brown sugar, mint sprigs, and ground cloves in a small saucepan. Bring the liquid to a simmer over medium heat, stirring to combine. Reduce the heat to low and simmer for 8 minutes. The mixture should be loose and syrupy. It will thicken more as it cools. Transfer the chutney to a bowl. Fill a larger bowl with ice water and place the chutney bowl inside of it to cool. Let the chutney cool completely, uncovered. Meanwhile, preheat the oven to 450°F. Remove the racks of lamb from the refrigerator and let sit at room temperature for 20 minutes. Prepare a sheet pan with a wire rack on top. Place the racks of lamb on the wire rack. Use a paper towel to pat them dry. Drizzle safflower oil onto each rack, using your hands to rub the oil over the entire surface area. In a small bowl, mix together the salt, garlic powder, and black pepper. Rub this mixture over the lamb, evenly distributing it across each rack. Make sure to firmly press the mixture onto the lamb to ensure it sticks. With the bones facing down, roast the lamb for 25 minutes, uncovered. This will result in medium lamb (cook longer or less if you prefer). Meanwhile, combine the butter, rosemary, and thyme in a small saucepan. Let the butter melt and come to a bubble over low heat. Simmer the butter for about 5 minutes on low to allow the herbs to infuse their flavor. When the lamb comes out of the oven, pour the butter mixture over the top of each rack. Cover the pan with a piece of foil and allow to rest for about 10 minutes. 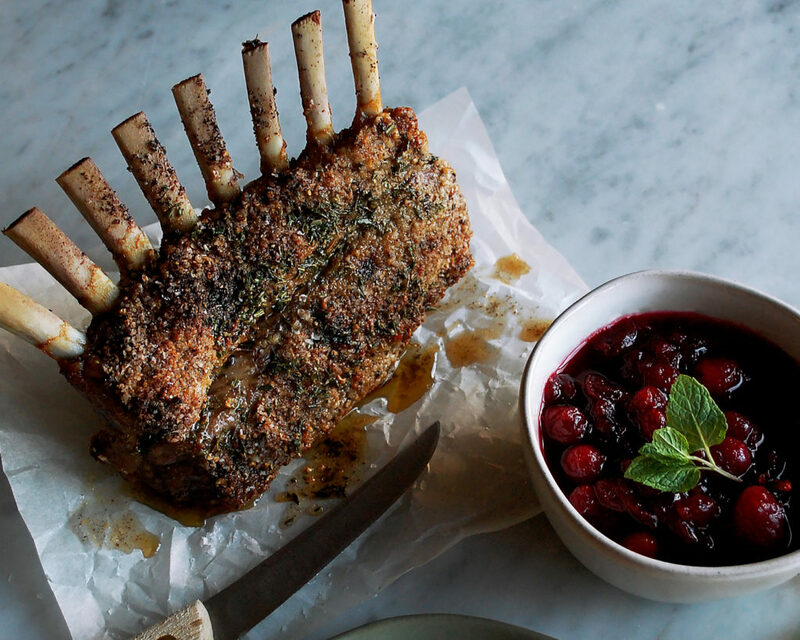 Slice each rack of lamb into four double chops. Serve with the mint cranberry chutney on the side. Oh my, you out did yourself here. Love this recipe. Kayla, I made this tonight for my husband and two young children. It was AMAZING, made even better with Atkins Ranch lamb. Thank you for the wonderful recipe.